Our calendar is now fully open and we have two tanks running. We’ll expand to four tanks as soon as we can get funding. 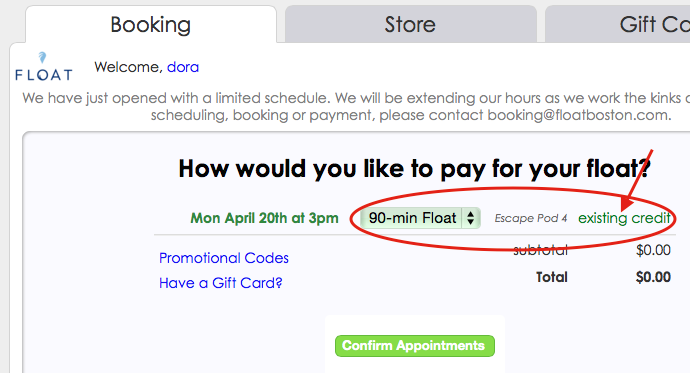 In the meantime, you can make an appointment at floatboston.com/book. Our calendar has been consistently full about three to four weeks out, but you can follow us on Twitter or Facebook to get news of open spots. Monday: first appointment at 1pm, last at 9pm. Tuesday: first appointment at 9am, last at 9pm. People attempting to claim their pre-ordered floats are encountering a few issues in the booking system. The system should immediately switch to show you “existing credit” instead of the price of the float. This is a bug we have reported to our booking provider. If you end up on this page and want to change what date or time you want to reserve, you can log out and log back in – this should at least let you get out of this page. Fixed! Click the red “start over” link at the upper left. Thank you for your patience as we are getting this operation off the ground. We’re fixing the problems as quickly as we can.